Using a geology-based assessment methodology, the U.S. Geological Survey estimated means of 19 million barrels of undiscovered, technically recoverable oil and 244 billion cubic feet of undiscovered natural gas in the Puerto Rico–U.S. Virgin Islands Exclusive Economic Zone. Schenk, C.J., Charpentier, R.R., Klett, T.R., Gaswirth, S.B., Pitman, J.K., Brownfield, M.E., Mercier, T.J., Wandrey, C.J., and Weaver, J.N., 2013, Assessment of undiscovered technically recoverable oil and gas resources of Puerto Rico and the Puerto Rico–U.S. 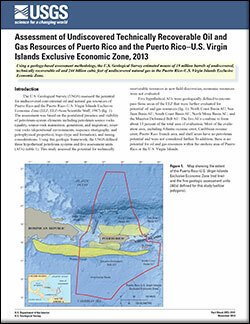 Virgin Islands Exclusive Economic Zone, 2013: U.S. Geological Survey Fact Sheet 2013–3101, 2 p., https://dx.doi.org/10.3133/fs20133101.